Three early compositions (1968-1970) by Steve Reich, one of the most prolific exponents of minimal music, in stunning interpretations by the critically acclaimed Ensemble Avantgarde. Available on vinyl (180gr, gatefold sleeve incl. download code) for the first time ever! Steve Reich (born 1936) is undoubtedly one of the key figures in 20th century contemporary music and along with Terry Riley or Philip Glass one of the founding fathers of so-called minimal music. With classics like “Music For 18 Musicians”, “Drumming” or “Different Trains” the American composer proved himself one of „a handful of living composers who can legitimately claim to have altered the direction of musical history“ (The Guardian). 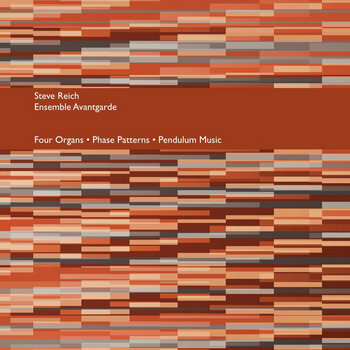 The four pieces on this collection date back to the time before his famous master pieces (1967-1970): “Four Organs” and “Phase Patterns” build on short, repeated patterns that gradually go in and out of phase with each other, creating “a shimmering matrix of sound that is both hypnotic and fascinating in detail” (Allmusic.com) and anticipate Reich’s later trademark sound. “Pendulum Music” is a process piece where only a few starting parameters are given: four microphones are suspended within an array of amplifiers and speakers, then set in motion – the shifts in feedback as they move in space create the music, the results differ with each new performance (as can be experienced listening to the 2 versions here). Reich’s early works are presented on this LP in stunning interpretations by Leipzig based Ensemble Avantgarde whose dedicated, inspired renditions of essential masterpieces of modernism (documented on CDs on reputated labels such as Wergo or Hat Hut Records) won them the Ernst von Siemens Foundation Prize and the Schneider-Schott Prize of Mainz. … this is a vital document of his earlier work and should be heard by any fan of Reich or minimalism in general. Highly recommended.